Joint Venture Strategic Alliance Marketing Book – FREE! You may not have heard of “90 Degree Marketing” (the title of the book), but a simpler name of this strategy is lead generation through strategic alliances. Why is this strategy one of the BEST marketing strategies? Because you can generate tens or hundreds of thousands of dollars in sales income in a year from this one strategy… without it costing your business anything! Almost every business can benefit from focusing on this one strategy yet so few businesses tap into the incredible power it has. While this strategy is has incredible benefits (zero cost leads), it tends to only work when you execute it with some special ingredients. Profit Transformations has generated over $1,000,000 in the eight previous years from this one strategy alone, for almost zero marketing cost. To succeed with this strategy requires to know a few secrets and implementing it, plus some skills in different areas. 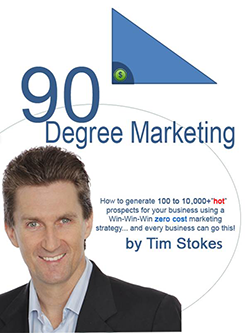 These secrets and skills could take you a year or more to understand, and then there’s the learning of these skills at a high level to make this strategy pay dividends, but it’s easier to take a short-cut and grab a FREE copy of 90 Degree Marketing to learn all about this exciting strategy. Want more marketing insights or training for free? Check out our mini digital marketing course.